An eastbound Expo Line train at La Brea Station. Photo by Steve Hymon/Metro. The new study from USC crunches traffic data numbers and finds, at best, mixed results that speeds on the Santa Monica Freeway and other major roads near the Expo Line have improved. As one source in the story says, that’s not surprising given that it’s unlikely any single transit project is going to fix traffic. My three cents: it’s always better to have this type of data than not to have it. That said, as attentive readers here know there are a lot of big cities with vast transit systems that also have traffic problems even near transit lines (pick one: San Francisco, Chicago, New York, London, Paris, Beijing, Moscow, etc.). Hard to quibble with any of that. To put it another way: no one wants to create a backlash against transit or investment in transit by inaccurately forecasting what it will accomplish. Correct me if I’m wrong, but I actually think the conversation around transit in our community and local media is more sophisticated than it used to be. That’s probably a reflection, too, that a lot of people in the L.A. area are from elsewhere or are well-traveled and understand that transit is not a magic pill. 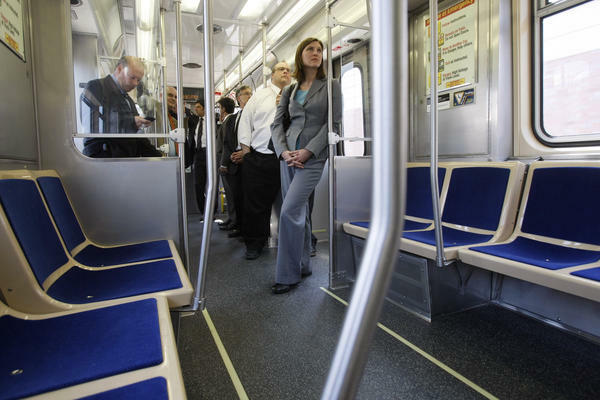 One other number to consider: about 35 percent of Metro Rail riders said they had a car available to them, according to the latest customer survey. Metro bus and rail ridership estimates are here. The new study finds that electric cars over their lifetime produce fewer greenhouse gas emissions than gasoline-powered vehicles. There has been a lot of dispute over this issue with some arguing that electric vehicles aren’t so green when their manufacture and disposal are considered. This study says the benefits of electric vehicles once they hit the road gives them the edge. 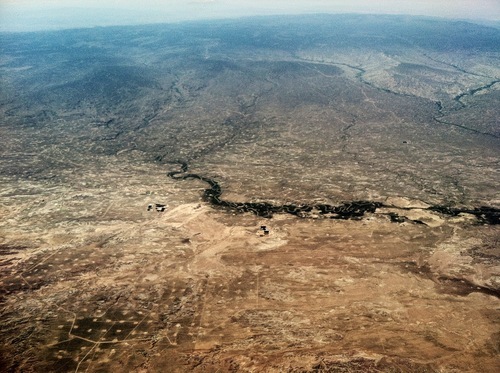 Oil and natural gas drilling in Colorado. Photo: NRDC. While many environmentalists and climate change activists praised the President’s decision to stop the Keystone Pipeline from being built, the article notes that there are not new restrictions on the amount of fossil fuels that can be extracted from federal lands in the U.S. There is a burgeoning ‘keep-it-in-the-ground’ movement, the article notes — but coal, natural gas and oil are still coming out of the ground at a higher rate than in recent times. And I don’t say that to be judgey. There are a lot of people who believe that it’s best to produce our own fossil fuels for all sorts of reasons, including national security. The obvious implication of ‘keeping it in the ground’ is that we need to get moving on alternative energy sources. Nov. 12: Regional Connector cost increases and potential delays, suspect in bus slaying arrested, bike share and bike infrastructure, Missy Elliot in the subway. My mind just wonder … If a clear mind like the ones that reflect their opinions or all the people involved in changes and new creations of transportation system lived their cars home and practice what they preach or their juicy salaries created a arrogance as to create a system “for the low wages people” that don’t even have a car. In my opinion, It would be better to give employees, especially government workers, transit passes and provide them with a government car, when needed and ONLY while actually on the job, than to provide them with all the parking that is associated with those jobs. If they need a car, while on the job, then we should provide it, but ONLY while they are on the job and NOT permit them to take that car home, except in the event of extreme emergancy such as after an earthquake or other natural disaster when public transit is more likely to be disrupted and this should include polititions too. Expo is just too slow to really get a lot of choice riders who often drive on the train. At an average speed of less than 18 mph, it just doesn’t go fast enough to get people who work Downtown on board as it is faster to drive on the freeway. Phase II will make Expo faster overall, but it will still be just below 20 mph. We shouldn’t really be building transit that doesn’t travel at least 25 mph much less 20 mph. The speed is right around national average, NYC subway is about 16 mph average (system wide) and much of Europe operates at the same average speed, between 14 mph – 17 mph. I think if Metro was given ROW downtown and neglected 1/3 of the stops at USC (3 stops for 1 school… ) it wouldn’t seem as sluggish. I never consider how slow we’re going until I pass the Galen center and the train inches along frustratingly. NYC has express trains though and Manhattan isn’t really comparable since driving isn’t as much of an option. Same for most of Europe. In spread out Los Angeles, people expect to cover more ground. @Matt New York has express trains that run through every borough except Staten Island, their system average is still ~16 mph and no system in Europe or elsewhere in the world has express rail service. I couldn’t agree with you more! The EXPO Line is way too slow, especially around the Fartdale (Farndale) station. This line really needs signal proirity! I think the biggest idealism that people had in their minds was that by investing in mass transit, we’ll get to 0 cars on our roads, get down to zero petroleum use, save the environment and 100% of Angelenos will start using transit. But realistically, this is impossible as even the most advanced cities around the world with great mass transit has not achieved such a feat. It doesn’t take too much to look at places like Japan or South Korea where they have excellent mass transit services, but at the same are countries that build automobiles and motorcycles such as Toyota, Nissan, Mitsubishi, Kawasaki, Hyundai or Kia for their domestic markets as well as export. But what differs from the US is that in places like Japan and Korea, those said automakers are also makers of railcars, such as Mitsubishi and Kawasaki Heavy Industries and Hyundai Rotem making rail cars at the same time as their other departments within their corporation makes cars or motorcycles. And it also should be noted that even oil producing countries such as UAE, Kuwait, Saudi Arabia, and Indonesia have invested heavily in mass transit systems while extracting petroleum. But what differs from the US is that in places like UAE, Kuwait, and Saudi Arabia re-invests the profits earned through oil sales into real estate development and mass transit. So what can be inferred here is that we need to move towards a society where it’s not General Motors or Chevron being against mass transit, but working together as a team where they work to improve mass transit in America. We can still continue to make cars and keep digging for oil while at the same time making mass transit better. All you need to do is look at how Japan, South Korea, UAE, Kuwait and Saudi Arabia does exactly that. Transit will never replace car travel, but provide the option of mobility without the burdens of driving. Every one of the most advanced transit agencies globally have formidable traffic congestion in their respective cities, but at least the have a choice on how they move about. In LA, with the opening of the expo, it won’t alleviate traffic tremendously on I-10, but it will provide a number of people access to job markets and housing from Santa Monica to Downtown without the need to drive. It’ll set a new precedent in LA, were commuting by metro becomes more prevalent, more common and certainly more accepted. With a changed mindset, Angelenos can begin to embrace more multi modal options and continue to repair the scars left on our city by automobiles. 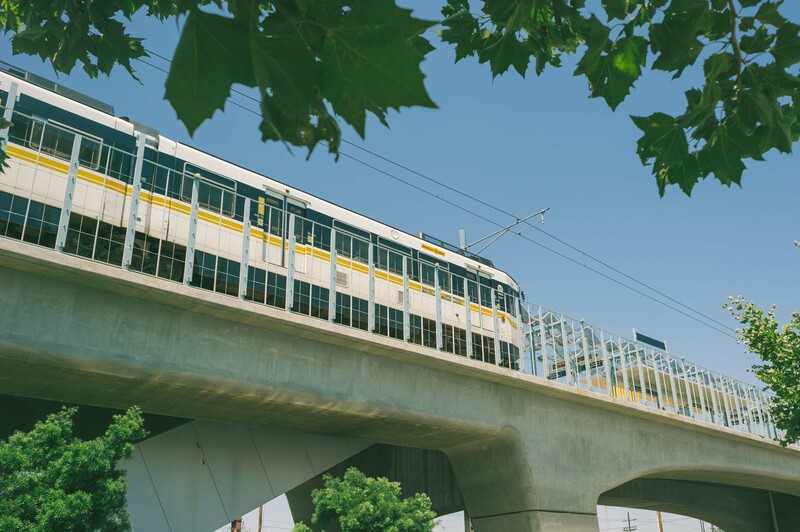 The Expo line has potential, but is a decent look into how Metro has its hands tied behind its back with limited options on signal priority, right of way, and community acceptance. For one: The Expo was an opportunity. The Right of Way had been vacant sicne the 80s, and truly was a form of urban blight that many have forgotten. If Metro had the funding and ridership to be the “perfect rail system” that train would’ve been elevated or underground, and even if not; triple tracked with a form of express service with thru ways and limited stop service. The infrastructure vs cost effectiveness for this was impossible though. I prime example is how Crenshaw LAX could not be merged to create a Santa Monica to LAX line or a Downtown LA to Santa Monica line. I dread the day someone drives onto the Crenshaw LAX tracks by accident and 100s of people miss their flights. Finger crossed though. The USC study was written in a vacuum. It assumes Expo was the only factor affecting traffic. It ignores (apparently) several important variables that certainly have increased traffic on the 10 in the period between the Expo opening and now. East-west traffic, particularly on the westside, was severely hobbled by Expo Line construction on Venice, Pico. And by 405 construction in the pass, and restricting Sunset, Wilshire, Santa Monica, Olympic, Pico. That pushed traffic onto the 10. Worse, it ignores the massive growth in jobs along the beach. And Playa Vista. And the recovering economy. Can transit defeat traffic? Well, if we apply Betteridge’s Law, the answer is immediately No. To elaborate a bit further, transit will never defeat traffic for as long as we continue to provide effectively unlimited subsidies to motor vehicles in the form of lopsided transportation funding. Road users cover barely 51% of road spending nationwide. Furthermore, there’s an ever-present mindset that the only way to beat traffic is to build our way out of it; as the 405 widening project (which Metro supported through Measure R funding) showed, even LA hasn’t fully outgrown this mindset. We need to accept that we will never be able to defeat motor vehicle traffic without major changes. When roadways are not restricted, they will always fill up to an equilibrium point that we call “congestion”. Every car that’s removed from the roads when a driver decides to take transit is replaced by another driver looking for a faster route – this is known as induced demand. Charging drivers for the real costs: this can come in the form of higher gas taxes, toll roads, or mileage-based taxes (as being tested in Oregon) – or some combination of the above. It’s also important to note that the latter approach doesn’t accurately reflect the damage caused by heavy trucks to roadways unless commercial vehicles have a variable tax rate based on GVW. Higher costs of driving will encourage drivers to seek alternatives, so improved transit and ridesharing options should always accompany such a policy. Congestion pricing: this is the approach that was taken in London, where drivers who want to enter the inner city are charged a variable amount depending on demand, to discourage driving and encourage alternate forms of transit. Dedicated transit routes: these can take the form of curbside bus lanes, BRT in the median, or fixed rail guideways separated from traffic lanes by curbs or other dividers. These options are unpopular with drivers because they restrict available road capacity, but if we assume that congestion is a constant factor, it’s a tradeoff that must be accepted because otherwise it’s impossible to increase the carrying capacity of a road without widening it further. Subways obviously bypass this problem by going underground, but they are also prohibitively expensive and only make sense along very high density corridors, like Wilshire Blvd. Beefing up the Metro Local routes with better timetables (headways of no more than 30 minutes) and service hours (at least hourly headways around the clock on major routes, as done by Foothill Transit on the Silver Streak), and eliminating wandering routes in favor of grids and connections. And of course, continuing to support HSR so there’s a viable alternative to driving or flying over longer distances in CA. “Can transit defeat traffic? Well, if we apply Betteridge’s Law, the answer is immediately No. Sorry, I have to disagree. I assume most of your statements are based on European ideas where it is the norm for cities like London and Paris to toll car drivers to come into the city and high taxes are considered to be the “new normal” over there. But, the other perspective that is that you have cities in Asia where they too have excellent mass transit systems but have yet to resort such levels of higher taxation and growing size of government, despite having one of the most densely populated metropolitan areas in the world. I will use Japan and South Korea as an example. In places like Japan and South Korea, both countries known as the place of excellent mass transit services still provides subsidies to their automakers like Toyota, Nissan, Hyundai, and Kia, they do NOT have usage charges for surface streets and the price of gasoline isn’t much different from the price of gas in California which we do pay more than the US national average due to our special blends*. Gasoline priced at $3.86 or $4.77 isn’t as high as what gas prices were in LA just a few months ago. $2.88 per gallon, which is factoring that LA already pays one of the highest gasoline prices in the nation. This discredits the argument that most people have used that Japan and South Korea pays three or ten times as much gas as we do, which is usually has been based on emotionally based arguments rather than actually taking the to actually fact checking it themselves. According to Harvard Atlas of Economic Complexity (http://atlas.cid.harvard.edu/), 13% of Japan’s and 8% of South Korea’s exports are based on automobile manufacturing. Implementing such policies will be detrimental to Japan, and likely similarly to South Korea. The same can be said for the US in which 3% of our economy is based on automobile exports. Furthermore, you make no differentiation between urban and rural areas. Rural areas in the US as well as in Japan and South Korea, are both heavily automobile dependent. California is heavily dependent on the agricultural sector and we cannot tax surface streets in say Fresno or have higher taxes on gasoline in Crescent City order to fund mass transit that only benefits urban areas such as Los Angeles, San Francisco, and San Diego. 1. All freeways in LA County be tolled, not just the Express Lanes but the actually getting on the freeway whether it be the 405, 101, 110, 605, the 91, etc. etc. will incur charges and be tolled per mile. 2. Surface streets should remain free, much as Tokyo nor Seoul has not tolled their surface streets. 3. At the same time, there has to be something given up by the transit agencies too. They cannot continue to be run as an ineffective government monopoly, but rather, gradually moved over to privatization. The European way is not the only way and Europe isn’t the only place in the world where there are excellent mass transit systems. There is equally the Asian way in which they’ve developed their own methodology to run transit system apart from socialization of transit. I think you’re simplifying my argument a little too much. I’m saying that the gas tax should be replaced by two completely separate methods: a carbon tax-and-dividend system (preferably on the national level), and a mileage-based road use fee based on annual odometer readings. Since the road use fee would be assessed annually, there’s no reason why it couldn’t also be set with different rates at the county level – so Tulare County might have a lower set of rate brackets than Los Angeles County. And since the gas tax would be eliminated, fuel prices would probably be slightly lower – although not as low as they could be given that the oil companies would be passing along the cost of the carbon tax. Dedicated transit only corridors are not being installed fast enough to keep up with the growth of driving in Los Angeles. The Census Bureau American Community Household Surveys estimate that in the city of Los Angeles between 2011 and 2014 the number of people whose main form of transportation to work was driving grew by about 9.1%. The study states that there are about 500,000 motor vehicle trips a day within the area of the Expo Line. If you multiply that number by the percentage increase of commuting in the city of Los Angeles it’s a total increase of 45,500. The weekday passenger boarding’s of the Expo Line has never gone past 30,000 a day. The net result would probably be that there is no noticeable reduction in the flow of motor vehicles after the Expo Line opened. To get a noticeable increase in the flow of traffic would require at least 60,000 boarding’s a day on the Expo Line. Double what it is now. I can’t see how a light-rail line could achieve that. It would be possible if it was a heavy rail subway, but that would take a lot more money to build. There are other ways to increase the capacity on the Expo Line, definitely not to the level to replace 500,000 drivers, but a little more today by some other innovative techniques which are used in other cities and countries abroad that deal with more passengers than LA does. These would be the cheapest way to increase the number of riders onto the existing trains we have today without resorting to triple tracking or adding more rail car sets or adding new construction to stations for longer rail cars. The Expo Line will reach 60,000 daily riders by 2018. Guaranteed. However, even this ridership volume won’t improve the congestion on the 10. As soon as one car stops using the freeway, another car will replace it. I can envision a future where you can increase ridership by deploying self driving cars. Smart phones can coordinate carpools to take people to their final destinations. This would be included in the fare up x miles from the station. The reduced the last mile issue that so many of us face. Sure, I can ride down Wilshire to Westwood, but to get to the Getty Center I need to take another bus half mile away or take uber. Until self driving cars are everywhere, I see an opportunity here for uber to work out a deal with metro Where metro subsidize rides up to x miles from the station. The real question is what is Metro doing with the ride data provided by Uber and Lyft. Under the T&Cs set forth by the CPUC, Uber and Lyft has to provide ridership data to the CPUC so as to benefit public transit agencies in California with the data to show where people are hailing their Ubers and Lyfts and where they are going with them. This data is far more comprehensive than any transit agency in LA because it’s the only true data that shows where people are getting on, what routes are being taken (for Uber Pool and Lyft Line), and where they are getting off, which TAP data can’t provide under a TAP-in only fare structure. For example, if the data from Uber and Lyft is showing that at many Uber and Lyft riders are hailing their rideshares from one particular area of West LA to the Culver City station or one particular area in the SFV to the North Hollywood station or somewhere on the Orange Line, then that data will be the golden goose that Metro can use to create a new bus route to service the first mile/last mile section to those stations. If Metro is just sitting on that data and doing nothing with it, then it only puts more into question of Metro’s competency because they have valuable data that shows where their future bus routes should be that they haven’t created yet and just letting Uber and Lyft make more money that Metro can be run themselves. I’m thinking that most of the Expo line is far enough south of the 10 freeway that it’s not a realistic alternative – they serve different areas, unless you’re going between DTLA and Culver City. Phase II may be more helpful, in that it’ll probably reduce the 10 traffic to West LA and Santa Monica, but there will still be drivers headed for the 405 who don’t have a better alternative to get to the valley or LAX (yet). 1. Building the Regional Connector will help. One of the things that constrains the number of trains on Expo currently is that Metro can only turn so many trains around at 7th/Metro at any given time. The Connector eliminates the turnaround as both trains from the Expo and Blue Lines will be running through DTLA. 2. Building the Purple Line Extension helps. The PLE hits many key destinations and job centers north of the 10 — Miracle Mile, DTBH, Century City and Westwood whereas Expo hits USC, Culver City and then the media gulch area in West L.A. and Santa Monica. 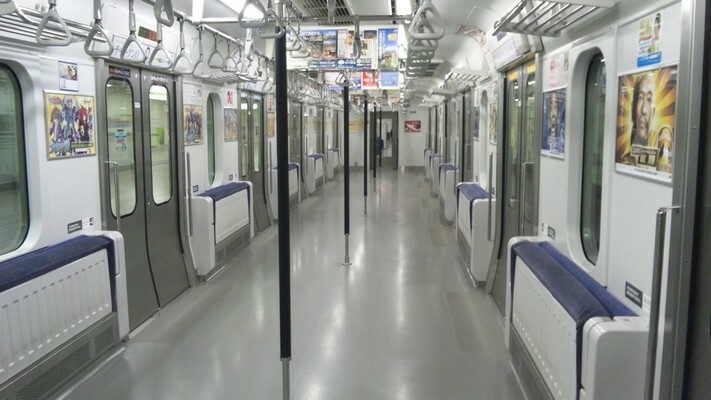 The east-west commuters will have two choices: either Expo or the subway. As you mention, it will be interesting to see what happens with a north-south transit project in the LAX to SFV corridor as well as what may happen with a northward extension of the Crenshaw/LAX Line. Either or both could potentially serve as a way to get from Expo to Purple Line (or vice versa), thereby making north-south and east-west transit travel by rail more plausible and possible for commuters. Obviously Metro is looking at a ballot measure for next year. We’ll see what projects it may fund. Local officials have submitted Sepulveda Pass and Crenshaw/LAX as potential projects. But, as always, the details will be important. Steve – Isn’t the near-term solution to increase capacity on Expo supposed be solved by improving the peak headway from 12 minutes to six minutes after the Phase 2 segment to Santa Monica is opened? That will double the capacity, to far more than the demand will be. For reference, the current peak load point on Expo is less than 18,000 daily passengers at the peak load point (which happens to be just east of the USC campus). By comparison, the current peak load point on the Blue Line is almost 38,000 daily passengers at the peak load point (near Slauson Street). Expo is slated to begin with 12-minute intervals. Yes, trains are supposed to be more frequent at some point — but I’m not sure when exactly that will happen. Interesting. I thought that part of the problem with the new rail car delivery was that they needed to build enough to be able to serve a 6-minute headway for the full alignment of the Expo Line. You want to fix congestion on the 10? Tear it down. There, fixed it! A fine example where this is definitely one of those comments worthy of those Willy Wonka “Please tell me more” memes. BTW, the I-10 goes from Santa Monica, CA to Jacksonville, FL. Which portion are you talking about when you say “just demolish it” without going into specifics on how this is to be done. The one California or the one in LA County? Certainly if you say “just demolish it” you have plans on how to do this? Let me guess, if it involves “just STFU and do what I say because I’m right and everyone who disagrees with me is wrong” which seems to plague the hypocrisy of “tolerant” and “open-minded” liberals these days, then you’re gonna get no where in a democracy. Said methodology may work in Communist China, but not in the United States of America. His point is that “congestion” is a really stupid metric. You could eliminate auto congestion by eliminating the roads! Would that be meaningful? No. The smart money has always known about “induced demand” –remove 20,000 cars from the roads, and it’s likely that 20,000 other people will start driving (joyriding, even). The purpose of lines like the Expo line is not to “reduce congestion”. It’s to BYPASS congestion. And it does that very well, speeding past lines of crawling cars. In fact, every promotion for expanded rail service I’ve seen in decades has been about BYPASSING congestion, not “reducing” congestion.